A memorable journey is not in the destination itself, but in the small moments and memorable experiences you allow yourself to have. A great journey begins the moment you get the longing to go, and stays with you long after you come home. Oftentimes, what you encounter in your travels is really a reflection of your own inner state. Here are five rituals to enhance your travel experience and prepare your inner self for the journey ahead, whether you’re going on an organized yoga vacation, a do-it-yourself retreat, a pilgrimage to sacred sites, an island adventure, or a simple blissful weekend to a nearby city. Before you go, focus on your intentions and set a purpose for the trip. What attracts you to the main destination? What quest are you on? Read memoirs or poetry about the people and the culture to transport you into the soul of the destination. For example, “To a Mountain in Tibet” by Colin Thubron is a great memoir if you’re planning a journey to Tibet or Nepal. Rumi’s poetry is perfect before a trip to Turkey, or to take with you anytime anywhere. Let yourself be inspired by the words of those who’ve captured the essence of your destination. If your intention is to unplug and disconnect from your daily life, leave your laptop at home, turn off your cell, and opt for silence. This allows you to be present and see things differently. Getting into a rhythm different from your normal life is part of the journey’s experience. And yes, it’s okay to disappear from loved ones at home. You are in a different time, space, and frame of mind once you leave the familiar behind. Take the journey as an opportunity to reconnect with yourself, discover new perspectives, and see the beauty in everything. 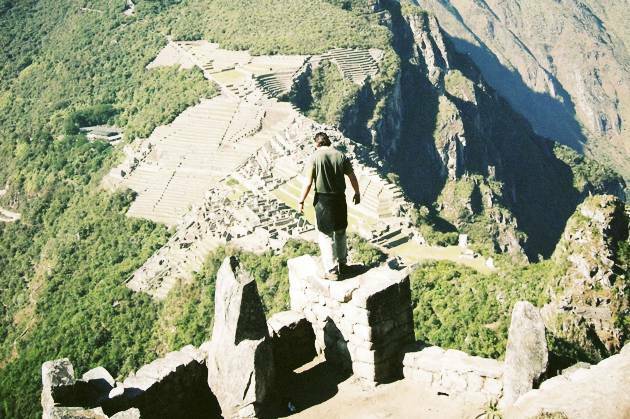 In Colca Canyon, Peru, a shaman said to me, “Feel the energy of the mountain. Let it in through you, flow with it.” I found it much easier to adjust to the high altitude of the canyon after listening to him. How do you “tune in”? Just breathe deeply with your surroundings in mind, and feel your breath and the energy of the place enter every cell of your body. When you are tuned in, you can also start feeling the many different energies of nature –more feminine and chaotic in rivers and seas; and more masculine and energizing in the mountains and the forests. By tuning in, you are also respecting and acknowledging the power of nature. Let it soothe you or energize you. In my previous post, The Yoga of Travel, I wrote that the joy of travel comes from an open mind, and often the best travel experiences are those unexpected, spontaneous moments made on a whim. Get off the beaten path and when you find a place you love, linger there longer. Leave room for precious moments to come, by scheduling as little as possible. We need to be vulnerable and open for serendipity to enter and guide us. In Angkor, I strayed from the crowd and found myself guided by a guard to a temple’s forbidden corners. In Peru, I meditated on a sacred stone in the Sacred Valley after being led there by a local teenager, which would not have happened if I had gone on the Inca Trail like the rest of my group. These personal moments became the most memorable parts of my journeys. The great travel writer Pico Iyer writes in the Foreword to 100 Journeys For The Spirit, "A journey of the spirit only starts with somewhere wondrous. It continues wherever we are, through the doors that wonder has opened." The power of a place that has touched something in you can stay long after the journey is over. Retrieve the essence of a place by closing your eyes and letting your mind and soul revisit the place, wherever you are. Think of the feelings and sensations that arose in you when you were there. Remember the textures, sounds and scents. You’ll be back in that magical place again, taking in the beautiful energy once more. Try this inner exercise when you need a new perspective.